You can support pollinators by providing flowers throughout the growing season. Spring flowering plants like willows, maples, plums, and gooseberries provide bountiful nectar and pollen for bees that are active in spring. 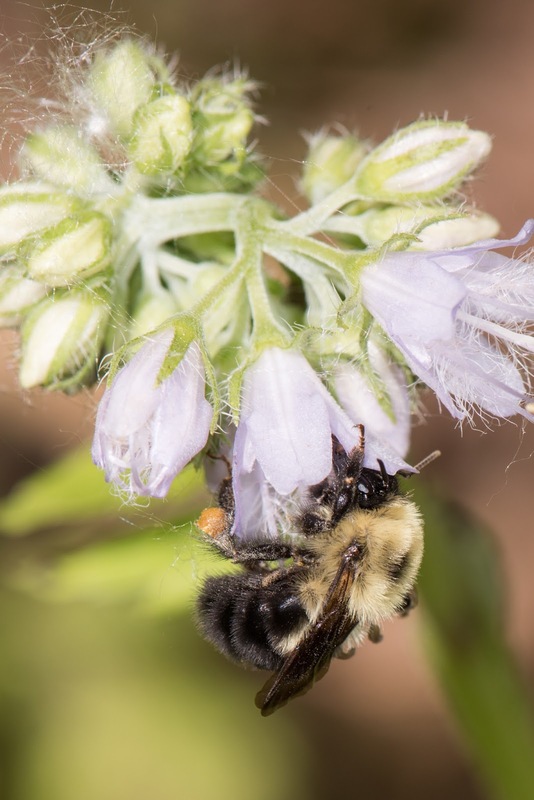 Many bee species in Minnesota are only out flying as adults during the first month of spring, taking advantage of these abundant floral resources to gather pollen to feed their young, which will be developing within the nest the rest of the year. After the early spring flowers have faded there is a gap before the next bounty of long-blooming flowers appears in early to middle summer. 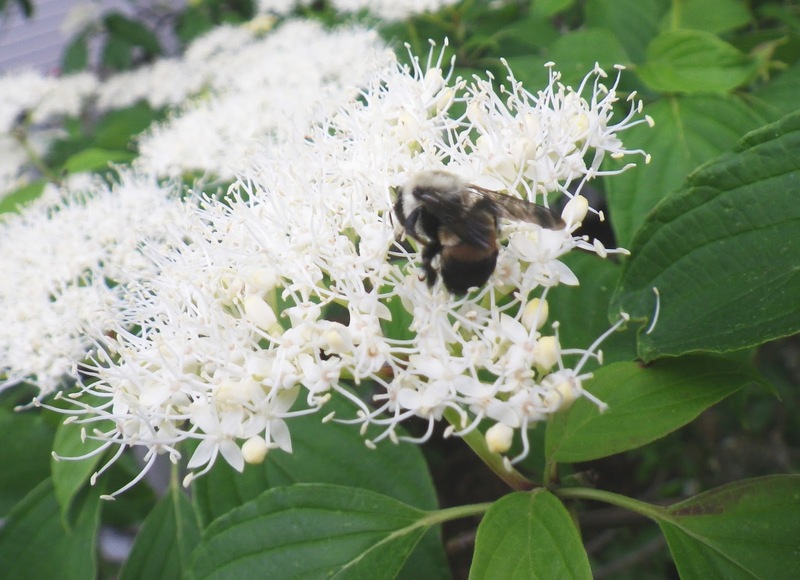 Flowers such as bee balm, purple prairie clover, and joe-pye weed, will continue sustaining bees throughout most of the summer. In many landscapes, there is a lull between these two heavy blooming periods. 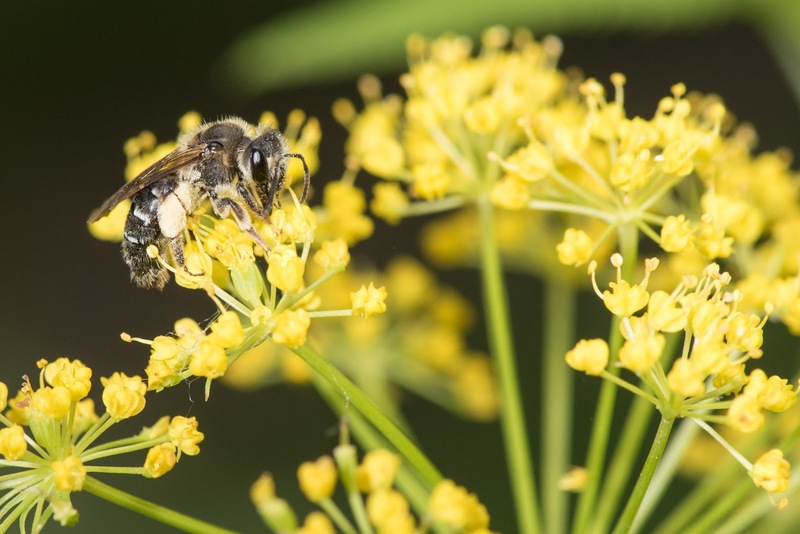 Although the early spring bees have gathered all the food they need, there are other bees active throughout the growing season like bumble bees, sweat bees, small carpenter bees, and the European honey bee. These bees need continually blooming flowers from April through September. For bumble bees, late spring/early summer flowers are crucial for colony development as colonies start from scratch each year and the fledgling colonies need pollen and nectar to grow. What can we provide for bees during this lull in bloom? Virginia waterleaf, Hydrophyllum virginiana, an easy to grow plant that can fill in shady understories. Two-spotted bumblebee, Bombus bimaculatus, photo by Heather Holm. Wild lupine, Lupinus perennis, a great provider of nutritious pollen. Mason bee, Osmia sp., photo by Heather Holm. Golden Alexander, Zizia aurea, tolerant of a wide range of conditions, provides pollen and nectar. Sweat bee, Halictus sp., photo by Heather Holm. Prairie phlox, Phlox pilosa, a great butterfly plant preferring full sun. 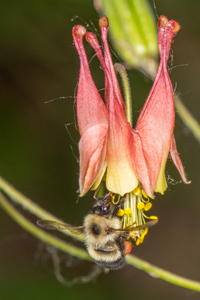 Wild columbine, Aquilegia canadensis, an easy to grow bumble bee plant. Half black bumble bee, Bombus vagans, photo by Heather Holm. Wild geraniums, Geranium maculatum, abundant flowers support a wide range of pollinators. 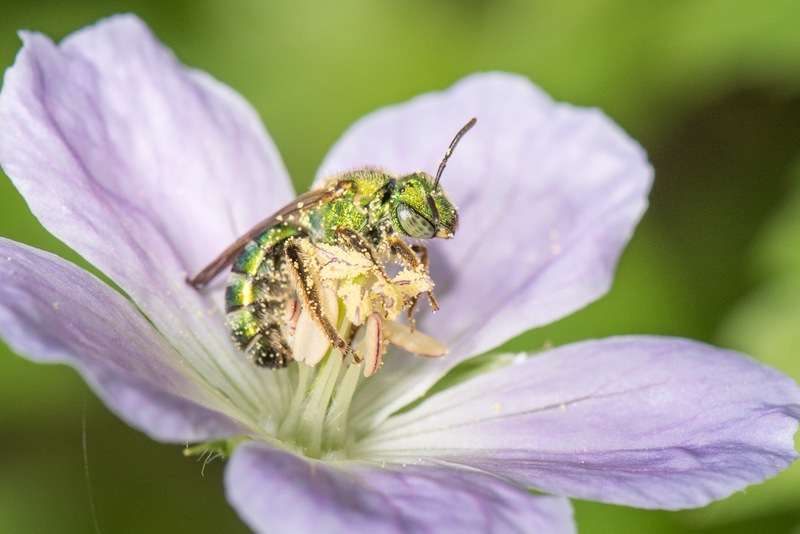 Photo: Green metallic sweat bee, Augochlorella aurata, photo by Heather Holm. Pagoda dogwood, Cornus alternifolia, a stately shade loving shrub. Photo: Brown belted bumble bee, Bombus griseocollis, photo by Elaine Evans. 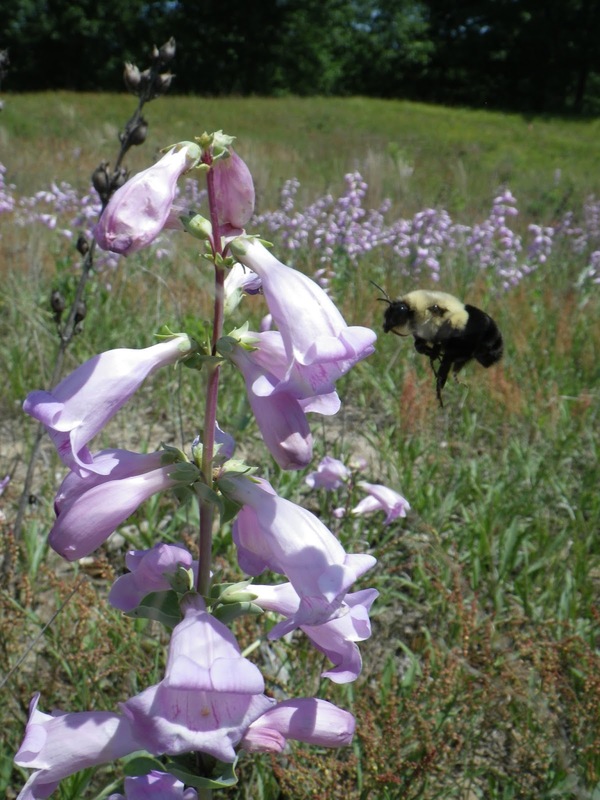 Beardtongue, Penstemon spp., a bumble bee favorite with several species providing variety in planting conditions. Photo: Common eastern bumble bee, Bombus impatiens on Penstemon grandiflorus, photo by Elaine Evans. 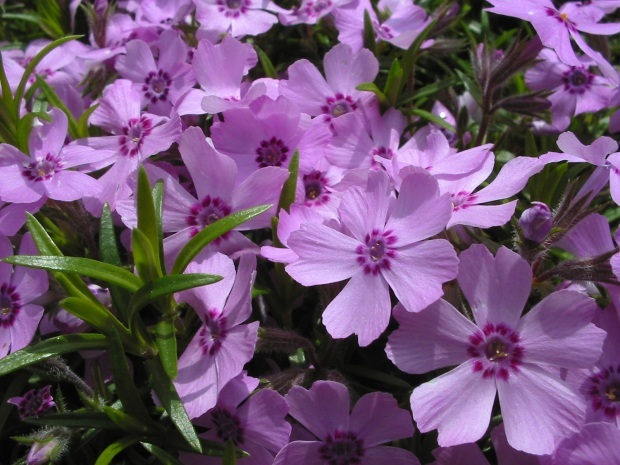 Check on your garden weekly to see what is blooming. If you notice a gap at any point in time, fill it with flowers for our pollinators. I really appreciate this information. It would be super user-friendly if you included links to each plant for more details. Thanks!